Can-Do, Will-Do Approach On Galileo Replacement Very Welcome By Howard Wheeldon, FRAeS, Wheeldon Strategic Advisory Ltd. Following several requests over the weekend for a view of what Prime Minister Theresa May confirmed on Friday – that she has told the EU that the UK will now go it alone after being blocked from playing a continued part in the development of the Galileo GPS satellite navigation system despite our having invested as much as £1.4 billion in the project so far below, including part of an excellent article written earlier this year by Tim Robinson, editor of the Royal Aeronautical Society monthly magazine ‘Aerospace’, I hope what follows will be useful. Given the appalling treatment of Britain by the EU in respect of our continuing involvement in the Galileo project Prime Minister Theresa May, acting no doubt on the advice of her National Security Advisor and Cabinet Secretary Sir Mark Sedwill and others, is absolutely right to conclude that, as a matter of national interest, the UK has no choice but to go it alone in developing an alternative to the EU’s Galileo Global Navigation Satellite System. A stab in the dark from me, but if the UK is to develop an alternative global satellite system on its own then the cost could well be in the £3 to £4 billion range with through life running costs on top. Although many of us would have preferred the status quo of remaining in Galileo it seems that a belligerent EU was determined to put too many hostages to fortune in the way to prevent that. That we are now on the road to develop an alternative is welcome and the speed at which the UK government has acted is commendable. Chances are that we will eventually share the burden of development with other allies and maybe acquire some existing and already developed technology required. We will see but this is a case of actions taking place on the back of words! An important point that no-one, including those in Brussels that have attempted to put obstacles to progress in the way of continuing UK involvement in Galileo is that our removal will starve the EU of important UK aspects of the programme, further raise the cost and importantly, push the Galileo programme back by at least two more years. The row over Galileo’s secure services had originally broken out in April following EU Commission staff in Brussels having decided that post Brexit UK involvement would be restricted because after that time the UK would be seen by the EU as being a foreign entity. Subsequently the UK Government stated that if the EU was to block UK participation in Galileo or restricted access to it in the future that we would demand a repayment of up to £1 billion from the approximately £1.4 billion that I estimate we have invested in the project so far. For the record, UK armed forces had been due to have access to the encrypted Galileo system in 2026 but, clearly following advice from the National Cyber Security Centre, the UK Government has rightly concluded that such is the difficulty of agreeing a post Brexit solution that it would no longer be in the UK’s security or indeed, national interests to stay within the Galileo project. Someone has recently suggested that failure of the UK to have access to GPS could cost the nation £1 billion per day. Both Mr. Williamson and the Prime Minister are satisfied that the UK in respect of our being a global player with world class engineers along with what the PM called our “steadfast allies” have sufficient security and satellite manufacturing expertise in order to undertake development and manufacture of a new Global Navigation Satellite System (GNSS). The urgency of requirement for the UK to press ahead developing its own GNSS system cannot be understated. For the military GNSS is, for instance, a crucial requirement in order for them to be able to navigate remotely piloted vehicles and other essential battlefield navigation requirements. For the nation as a whole GNSS plays a crucial role in running energy networks and many other utilities whilst at the same time, providing essential services for civilian smart phones and the like. So where are we now? Back in August the UK Space Agency, with the support of the Ministry of Defence, launched a feasibility study gathering views of not only what needs to be done but what can be the art of the possible! 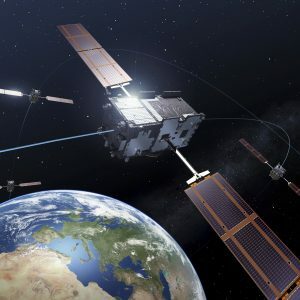 Backed by a £92 million Government grant, the feasibility study is charged with exploring feasibility and design options and to potentially draw up what would be an alternative sand more up to date satellite system than Galileo in order to ensure that UK national security and sovereignty over GNSS capability is assured. I am told but cannot confirm that key contract options are also currently being tendered with more than fifty UK companies having so far sought involvement in the project. The proposed GNSS system would use the UK’s overseas territories and crown dependencies as sites for the ground based infrastructure needed to ensure the system has worldwide coverage. The UK GNSS system will be designed to be compatible with the current US GPS system meaning that there would be back-up should there be a malicious or unprovoked attack on it. “Today’s militaries are highly dependent on satellite navigation and the development of Galileo removed a key fear for European armed forces, that one day the US could decide to flick a switch and make their tanks, aircraft and ships almost useless overnight. This, however, is an extreme example and a more routine security benefit of Galileo would be to provide extra redundancy and resilience if the US GPS system is itself being jammed or degraded by hostile actors. Recent reports of Russian EW jamming of US GPS in Syria is a clue that there is already a ‘contested environment’ battle underway and that Galileo may be useful, not only to Europe but to its allies as well. A further benefit of Galileo’s PRS was that it would avoid some of the weaknesses of the GPS military service such as user terminals that are bulky, power-hungry and difficult to set up. Galileo is not the only ‘alternative-GPS’ around. Russia has GLONASS, while China has developed Beidou. Other countries have their own regional satnav systems as well: India has the RNSS while Japan has the Quasi-Zenith Satellite System. First agreed in 2003, the €10bn Galileo system is Europe’s answer to US GPS – itself a global navigation satellite system (GNSS) originally built for the Pentagon but now enabling a range of services from precision landings at airports to Pokemon Go. GPS signals from 31 satellites in orbit (24 for the basic system plus currently 7 spare) are divided into lower accuracy public (positioning to 5m) and encrypted frequency for US military (and allied) users – with military users benefiting from both to achieve higher accuracy. The US military still controls and operates this system and thus Europe saw the need to develop a sovereign capability of its own. Galileo, now partially operational, is set to offer enhanced public accuracy over the US GPS system, as well as a capability that Europe alone controls. While much of the publicity and need for Galileo stressed commercial and para-government services (with increased public accuracy opening up a new market for location-based commercial services) what was unspoken (given the EU’s sensitivity in defence matters) was the potential for Galileo to provide enhanced accuracy and resilience for military users – for tanks, ships, aircraft and precision munitions. This restricted Galileo mode, PRS (Public Regulated Service) for government, security, military and safety critical operators is set to be introduced in the next few years. Currently Galileo consists of 19 satellites (6 of which are still being tested) of a total planned constellation of 30+, in medium Earth Orbit (MEO), providing close to 1m positional accuracy for public users. The encrypted service will be more accurate but more importantly will be more immune to interference, accessible only to approved users, and available even if the public service is switched off for security reasons. The other sensitive UK industry role has been to provide much of the encrypted computer-based systems that underpin the PRS (Public Regulated Service). This mostly classified work has complemented the role of UK Government encryption experts from GCHQ and MOD who have helped to define the nature of PRS and how it will be managed. The second is access to Galileo’s highest accuracy signals or PRS for security or military customers. PRS, which is expected to be officially ready by 2020 (note – according to industry sources more likely to be 2022-2024 even before consideration of how Brexit [and removal of the UK] might further delay it) will provide a level of accuracy similar to the newest encrypted M-code from the US GPS – itself delayed. I note that on Twitter Tim Robinson reminded that at a recent Royal Aeronautical Society Conference someone had suggested that instead of replicating the US/EU satnav system that this might be the opportunity for the UK to leap ahead with an unjammable quantum based navigation system – a chance perhaps to lead the world in new technology? A nice thought but one that for the UK on its own would require financing and risk that would unlikely be acceptable at this particular juncture in our fortunes. Anyway, my thanks to Tim Robinson and to the Royal Aeronautical Society for the excellent additional context that I have been able to provide here. Can we afford it? My answer to that is that yes and that is based on the notion that quite frankly we cannot ‘not’ afford to do it! Do we have sufficient expertise? With partners I am absolutely sure that we have all that we need. Will we have a launch facility? Given that the UK Government has already announced a Space Defence Strategy which will be led by the Royal Air Force and also confirmed development of the first of what are intended to be four launch sites (the site chosen in Sutherland, Scotland is to be the first UK designed spaceport able to launch vertical rocket and satellite launches from the early to mid-2020’s) I do not see this as a problem. The US has available launch facilities too as does India. Will we succeed? Yes we will. Previous Post£1 bn Boost for Defence – Well Done Gavin Williamson By Howard Wheeldon, FRAeS, Wheeldon Strategic Advisory Ltd.Next PostProgress Toward Burying IHAT and Giving Soldiers Better Protection From Prosecution By Howard Wheeldon, FRAeS, Wheeldon Strategic Advisory Ltd.